Brad Kjar, Director of Operations, U-Save Car & Truck Rental gained some notoriety this week when he was awarded the dubious Pinocchio Award by the website UnhappyFranchisee.Com. The award was presented via a the sarcastic blog post skewering Brad Kjar and his employer Franchise Services of North America Inc., parent of the U-Save franchise chain. The muckraking franchise website had published a list of U-Save franchise complaints, and then invited company executives including Brad Kjar to provide rebuttals or counterpoints. Instead of responding to the invitation, the site alleges, Kjar sent out an email that the owner of Unhappy Franchisee also owned a site called BestFran.Com. 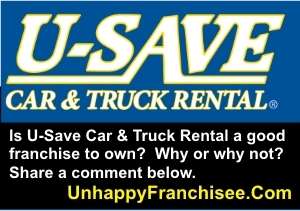 The owner of Unhappy Franchisee does NOT own that website or a business of that sort. In fact, he contends, there is no such business posted at that website address. In an an email distributed by Kjar to U-Save franchise owners and executives, he alleged that the owner of Unhappy Franchisee published the “hit piece” because Kjar had turned down his proposal for generation of positive reviews for U-Save Car & Truck Rental franchises. Unhappy Franchisee states that Brad Kjar’s allegations are preposterous and they demand he produce the proposal and correspondence he allegedly received. The publisher of the franchise information website has challenged Bradley Kjar to produce the proposal he was allegedly sent by BestFran.com – or to apologize for lying. U-Save Director of Operations Bradley Kjar mentioned in his leaked email that U-Save was implementing an online review management program with TrustPilot. TrustPilot is the controversial Danish company known for allowing fake reviews and enabling clients to suppress negative reviews. Congratulations to Brad Kjar on his Pinocchio Award! Don’t go near this franchise. You will get screwed and you will lose money.